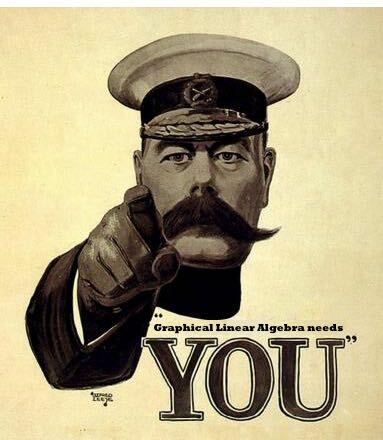 Filippo, Fabio and I are looking for PhD students to work with us on topics related to graphical linear algebra. We have several open questions to crack and promising lines of research that we are looking forward to exploring. I will add concrete problems and topics on this page, as we get around to discussing them on the blog. If you are interested and already have an undergraduate degree in maths, computer science, or related fields, we would like to hear from you. Email us! If you are in your final year of undergraduate studies then we also want to hear from you so that we can plan ahead. For practical matters, working with us will mean being based either in the UK (at the University of Southampton or UCL), or in France at École Normale Supérieure, Lyon. In Southampton and UCL there are funded positions available each year. If you are a UK or EU based student then you may be eligible for a PhD fellowship which comes with a standard living allowance for three years. Funding for non EU students is more difficult to get, but is sometimes available. You may also be eligible for funding from your native country. In Lyon, there are also three year PhD fellowships available. All fellowships, both in Southampton and Lyon are awarded on merit, and so are quite competitive. And, no matter where you end up, you will likely work with a combination of the three of us; we are big fans of co-supervision. So what are you waiting for? Contact us and join the string diagrammatic revolution!